4 photographic prints : b&w; ; 5 x 7 in. Mr. Tanaka and Japanese garden at Grieve residence in Los Angeles, California, December 8, 1961. 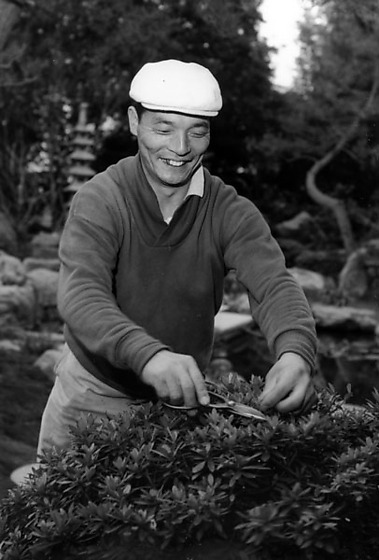 Includes smiling man in sweater and flat cap pruning a shrub in garden; various views of garden with shrine, pond, stone lanterns, bridges, entry gate. Typed on original negative envelope: Tanaka, Mr. -- Garden (Japanese Garden) Rafu Shimpo. The Grieve residence was located at 8443 Melrose Place, Los Angeles, California.